Hermitage Castle is the archetypal border castle. During the Middle Ages it changed hands several times between the Scots and the English. The first structure on this site was built in the 14th century and was an oblong erected around a small courtyard. It was rebuilt a few decades later by the Douglas lairds when it became a very large tower house. Today the castle is more or less just a shell of the original castle but it is imposing enough to conjure up ghostly images in the mind of the visitor. There are two main ghosts which are supposed to haunt Hermitage Castle. The first one is that of Sir Alexander Ramsay, Sheriff of Teviotdale who during the middle part of the 14th century was unwise enough to incur the wrath of Sir William Douglas who was a Knight of Liddesdale. Although the two men had been close allies, when Ramsay had the sheriffdom conferred upon him by King David the second, Douglas was furious as he felt he had a real claim to the title. Ramsay was captured by Douglas in Hawick then taken to Hermitage Castle where he was thrown into a dungeon and left to starve to death. The tragic emaciated figure of Sir Alexander Ramsay is said to still haunt the ruins of Hermitage Castle to this day. The other ghost is supposed to be that of 'Bad Lord Soulis' or 'Terrible William' as he was also known. It was widely believed that he practised black magic incorporating young children from the local area into his hideous rituals before killing them. Eventually it is said that people from around the area stormed the castle and bound him in chains before wrapping him in lead and throwing him into a boiling cauldron to meet and agonising end. People say that the ghost of Terrible William has been sighted in the grounds of the castle and that the tortured cries of the abused children have been heard on occasions. 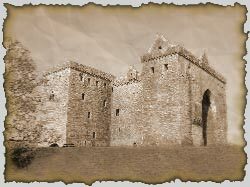 In 1492 AD the Douglases exchanged Hermitage for Bothwell castle on the Clyde and in due course the notorious Earl of Bothwell gained possession of Hermitage Castle at the time that he was acting as lieutenant on the borders for Mary Queen of Scots whom he later married. Not surprisingly Mary Queen of Scots ghost is also said to occasionally appear in the castle.